Posted December 17, 2014 by Dr. William Myers & filed under General Dental Articles. The holiday season is one filled of festive fun, family time, food, and fellowship among friends. It may also mean a calendar packed with parties, days of travel, and long excursions to the mall. The last thing you want during this joyous time of year is to get sick. 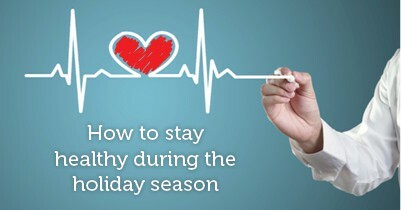 At my dental office in Warsaw, we’re not only focused on your oral health, but your overall health too, and with these tips, you can help keep your body in tip-top shape all holiday season long. It’s common to walk into a holiday party and immediately be assaulted by heaps of food, drinks, sweets, and treats. While you’re completely expected to indulge in a little holiday feast, it’s important not to overeat or overdrink. A little secret from your dentist in Warsaw is to pop a piece of sugarless gum before heading to the buffet. Chewing the gum tricks your brain into thinking you’re already eating, which means you actually eat less. Along the same lines, avoid too many glasses of wine, eggnog, beer, hot cider, toddies, or Pimm’s Cup. The rule of thumb is to alternate each glass of alcohol with a glass of water and try limit yourself to two beverages per party. At m dental office in Warsaw, we want you to have the best holiday season yet, and following these tips can not only help you stay healthy, but can make it much more enjoyable too. From our family to yours, we wish you a happy, healthy, and joyful season.